Junior entry. Has had the look of a pro passer since his freshman season. The 3 year career at UCLA didn’t pan out the way many were hoping for, but it can’t be pinned on him. His supporting cast was dreadful. The pass catchers dropped more balls than any of the other QBs in this top-of-the-draft discussion, there was no running game to lean on, and the offensive line was very leaky up the middle. With all of that, Rosen still threw for 9,342 yards and 59 touchdowns. One red flag, however, is that he missed 8 games over the past 2 years with various injuries. And another nugget here is that more teams are fearful of his knees not holding up, as that is a consistent occurrence with tennis players when they get in to their late 20’s-early 30’s. Rosen was a big time tennis player in his teen years, so it is something to consider. Here is something I am confident can be put to bed. Rosen is not a character risk. He is not going to be an issue with the media, he is not going to be a problem with the coaches and players. He is not going to be a problem socially. This kid knows more about football than a lot of current professionals. He studies it hard, practices hard, and was head and shoulders on another level than his teammates mentally and physically. If you could guarantee be Rosen can stay on the field, his grade would be 90+, elite. NYG could be the perfect spot for him as it will allow him to add bulk to his frame for a year or two, use his intelligence to pick up the schemes and tendencies of the NFL, and be ready to rock in 2019 or 2020. During that time, you let Davis Webb handle backup duties and if he proves to be a solid player, you have a very good problem on your hands, one that several teams will pay up for. A record setting quarterback that started off as a walk on at Texas Tech, losing his job to none other than Davis Webb. Talk about a potential complete 180 degree turn. Mayfield transferred to Oklahoma, won over the staff, and never looked back over his 3 years as starter. He ended his career with a Heisman Trophy-earning performance in addition to re-writing the OU record books. Mayfield threw for 119 TDs /21 INTs and an amazing 12,296 yards in his 3 years with the Sooners. I was split on Mayfield and Rosen for a long time. I would be equally excited about either, but Mayfield carries more risk. His competitive spirit and on-field bad boy image can be viewed as both good and bad. I actually think it makes him a better player, as he is constantly trying to prove himself and his worth. He is hungry to win, hungry to succeed. It is actually a refreshing thing to watch these days, to be honest. However my fear is this: How will he act when a stadium starts to boo him? The team around him is falling apart, guys are chirping to the media, coaches throw him under the bus. Can he handle that? Honestly, I’m not sure. And having that at QB would scare the hell out of me. Talent and ability, however, he has it. I rarely give a second thought about his height. It is not ideal but the way you can manipulate an offense with playaction and rollouts, Mayfield’s height won’t be a major factor. This kid is a winner and will out-kick his coverage when it comes to overall talent. A 2 year starter that came in to the 2017 season as the poster boy of this draft class. After a 9 game run in 2016 that was capped off with one of the best Rose Bowl performances in history, Darnold had everyone thinking he was the next big thing. Maybe expectations were unfairly high, maybe not. But truth of the matter is, his 2017 season was nowhere near those expectations. He turned the ball over 24 times, most in the nation. Every time you thought he was turning a corner, he put up another head scratching performance. It was a year that created more questions than answers. Darnold is still generally considered the top quarterback in this class among people I have spoken to and the media. The thought here is that if he can learn to play within himself, read defenses, and make his mechanics more consistent, he has the goods. Those are all correctable issues. Some of what people don’t like about him is what evaluators were nervous about with Eli Manning. Another parallel there is they both seem to rise to the occasion in big games/moments. I do like Darnold, just not enough to use a top 5 pick on him and not enough to take him in front of Mayfield or Rosen. There is a lot of boom and bust. His ability to create on his own his a big deal. His calm demeanor can be a big help. I just hated to see a lack of progress over his 2 year career. He didn’t get better and if anything, he got worse as time went on. If NYG brings him in, he can sit a year and not be rushed which would be in his best interest. However his issues need to be ironed out playing, not sitting. I think there are better situations for him than NYG and I still expect him to go #1 overall, anyway. Junior entry. Three year starter that had his coming out party in 2016, winning pretty much every piece of individual hardware a quarterback can, including the Heisman. Production is off the charts here with Jackson. He is the first player in history to amass 3,000 yards passing AND 1,000 yards rushing two consecutive years. In a league where putting points on the board is an absolute must, Jackson is walking away from a two year run that saw him score an amazing 95 touchdowns. There are some character red flags and overall shortcomings as a passer that need to be overcome, but there is no denying how dangerous this player can be. Jackson is an athlete first, runner second, and passer third. If I want to be simple and blunt, that pretty much doesn’t work in the NFL. His ability to run with the ball does and always will strike fear in to opposing defenses. His presence on the field alone will make them adjust, it will make them uncomfortable. He is one of those rare players that doesn’t have a cap to his speed. He is simply faster than the guy chasing him, end of story. Jackson, however, has a ways to go as a passer. He struggles to make multiple reads and progressions, his lower body is as inconsistent as it gets, and he doesn’t keep his eyes downfield while he is on the move. If he takes just half the hits in the NFL that he did in college volume wise, his career won’t be long. The body type isn’t there. Jackson’s only option is to improve mightily as a passer and it will take a ton of time and work. I don’t have a ton of access or inside information, but there have been things said that worry me when it comes to how much he is going to try and change his game at the next level. He is not Mike Vick. Even more, he is nowhere near Mike Vick. Fourth year junior entry. After a lightly recruited high school career, Allen spent a season in community college before being recruited to Wyoming, home of Carson Wentz’s former college coach. After breaking his collar bone in 2015, Allen finally hit his groove at the FBS level as a redshirt sophomore in 2016. His performances were very up and down but there was no denying the ceiling his talent presented. Allen entered 2017 as one of the darkhorses to overtake the top spot on the QB stack, however we simply saw more of the same. He missed two more games with a shoulder injury but did return for their bowl game, throwing 3 touchdowns against Central Michigan. Allen earned a day 2 grade on my sheet. By no means does that mean I have the “Do Not Touch” label on him, but the thought of using a top 5 overall selection here is too risky for me. Allen has a long ways to go and lacks a lot of passer-traits that are essential to consistent QB success in the NFL. When the first, second, and third things people say about Allen all have to do with how far he can throw the ball, or how much velocity he can put on it, it is an immediate red flag to me. He has failed to show the ability to put touch on the ball up the seam between levels of the defense. He doesn’t look comfortable in the pocket either. His footwork is very sloppy and it causes a lot of erratic throws on what should be simple gains. I also didn’t like how he carried himself during games where he struggled. Just didn’t scream “leader” to me. And the last glaring stat that I can’t seem to get out of my head: In 2017 he played against 5 teams that finished with winning records. His combined stats in those games? 65 for 130 (50%) – 661 yards – 4 TD – 5 INT. One more…in 2016/2017 combined he played against 3 opponents from power 5 conferences. His stats in those games: 48 for 96 (50%) – 427 yards – 1 TD – 8 INT. Not exactly someone that brings his best against the best, and that is not a small sample size. Fifth year senior. Began his career at East Carolina. Was the backup after his redshirt year before winning the job in 2015. He was injured before the season began, however and when he didn’t get the starting gig back, he left for Virginia as a graduate transfer. He then spent 2 years with the Cavaliers and got off to a hot start, setting some all time single season records. Benkert went on to start all but 1 game over 2 years, throwing 46 TDs and 20 INTs. When things are comfortable for him, his release looks good and there are plenty of pro-caliber throws in his arsenal. He has had several stretches that scream upside but the consistency issues against pressure were a constant. He just couldn’t seem to overcome his loss of mechanics and decision making when the pocket got dirty. Benkert has some impressive tools and natural arm talent to work with, but I don’t see more than backup-caliber potential. An accomplished collegiate passer that threw for 86 TDs over the past three years. He actually received some Heisman talk in 2017, leading the nation with 377 yards per game and 37 touchdowns. Rudolph comes from a spread attack that never saw him call plays from a huddle of handle snaps under center. While that has become more and more common with kids coming out of college, he will still have a lot of footwork-based adjustments to make. Rudolph is a very stiff athlete, he moves like a 35 yard old veteran already. While that just isn’t his game in general, he does look way too immobile in the pocket. He has heavy feet and struggles to evade any sort of pressure when his quick read isn’t there. Rudolph doesn’t show a ton of zip on his passes and there is too much loft on his deep ball. He got away with a lot in college that he simply will not at the next level. I think he is a career backup but one that will be around for a long time. He is a top notch kid that has some “extra coach” in him. Fifth year senior. The only 3 time team captain in Ohio State history. Unreal production over his career as both a passer and runner. Barrett took over for an injured Braxton Miller, lost his job to Cardale Jones, then took back the job and left the program with several all time school records. I don’t see Barrett as being a guy you want driving the bus, but I think he will be one of those invaluable backups in the league. He has top notch intangibles and I think he can make things happen in a pinch. His arm talent is very limited, but there are other parts to his game that can make things happen. He is a legit day 3 option for the purpose of having a long term backup locked in for years. Fourth year junior entry. Three year starter with tools and a few stretches of quality tape. Litton has the look. He is big and strong, he can rifle the ball in to tight windows, and he has a really clean release. When he’s on, there is a level of touch and accuracy to his throws that make you raise your eyebrows. What is frustrating wit him, however, is the lack of consistency as a decision maker. He isn’t very calm, cool, or collected when the pocket gets crowded. I’m not sure he is a kid that really understands defensive schemes and tendencies. He is a certainly a developmental prospect but I think his upside is higher than most of the names in this tier. Fifth year senior. Began his career at Iowa but quickly transferred to Texas Tech. Was a backup until 2017. Shimonek doesn’t have a ton of experience as a starter but there are tools here to work with. For those that like Josh Allen and the arm talent based ceiling, Shimonek could be your day 3 backup plan. He can really wing it and has made several deep throws that make you want to look twice. Shimonek was in and out of the lineup under Kliff Kingsbury, who is slowly stating to lose his status in college football. He is a tough kid that can leave the negative thoughts out, a very important mental trait. Fifth year senior. Began his career at South Florida where he had a pretty poor 2 year run. He transferred to Western Kentucky and started for 2 more years. The wide open offense enabled him to produce some gaudy stats but there is more to him than that. White is a really talented thrower. He has enough arm strength to make all the throws but he doesn’t use it enough. He has almost gotten too used to trying to place and drop the ball in to buckets rather than firing it in there. White will also have a ways to go when it comes to making reads and working through progressions from the pocket, but there is arm talent here that most in this class don’t have. Fifth year senior with 3 years of starting experience. Left Washington State with a handful of career passing records in Pac 12 history. After a couple years of excellent production in the Mike Leach scheme, Falk was on the radar for being a 1st round pick at the beginning of the season. I never saw it, however. He does control the system and himself very well in addition to being a very accurate passer. Against college defenses, a guy like this can really dominate and that, he did. But when looking for QB traits when it comes to pocket movement, reading defenses, and firing the ball in to tight windows, he has too many negatives for me to think he can ever be a starter. Four year starter. I’ve been told McGough has had some of the more impressive visits with coaches and teams when it comes to whiteboard talk. Very smart and advanced football IQ. McGough occasionally made plays that most guys in this class haven’t, plain and simple. Really innovative with the ball in his hands against pressure and he makes the difficult, athletic throw look natural. He didn’t have to make a ton of deep throws, however. He needs to show he can be more of a downfield passer but who knows what will happen once he is put in to a more sophisticated situation. He is worth a shot in the dark. Fifth year senior. Began his career at Tennessee. After battling a leg injury and losing the quarterback competition job to Josh Dobbs, Ferguson walked away from the game. He lost his passion for a year but ended up starting from the bottom at a community college in 2015. Memphis took notice and he took over the starting gig once Paxton Lynch left for the NFL. He had a really nice 2-year run. Ferguson has matured and comes in to the draft with one of the most “sling it” mentalities in the class. He is a hard nosed player with good arm talent but has a long ways to go mechanically and schematically. From day one, I’ve said this team needs to go QB at #2 overall if, and only if, they have a guy that meets the grade. This team has rightfully committed to Eli Manning for at least another year (I think it will be 2) but John Mara has said multiple times that he loved how GB passed the torch from Brett Favre to Aaron Rodgers, whom sat for 3 years prior to taking over as the starter. I can see that being the case with a QB here and even though the immediate dividends wouldn’t exist, it would be the best long term move for the organization. Now, if the coin flip between a QB and Barkley lands in favor of former, who will it be? I can’t imagine anyone in those walls being convinced Josh Allen is the guy and Baker Mayfield has had too many immaturity-based issues for me to think he is the next NYG franchise guy. I think it comes down to Darnold vs. Rosen if both are available. If CLE goes with one of them at #1, the decision is obviously much easier. Darnold has more Eli in him when it comes to personality But after his career, does NYG really want that along with the turnovers? I hope not. 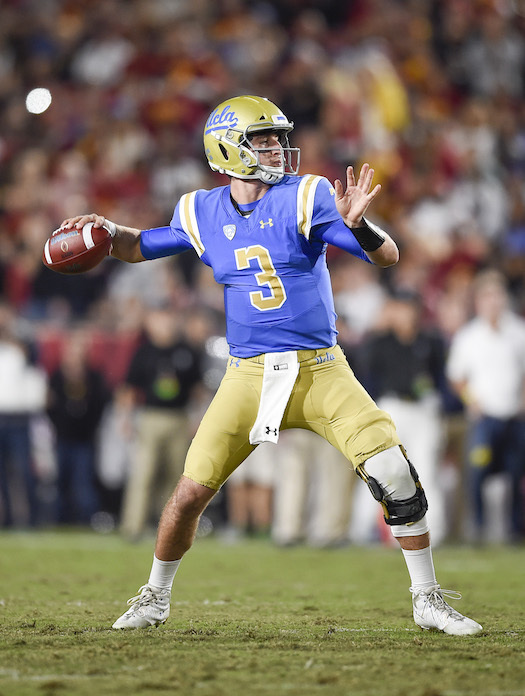 Rosen is a perfect fit for the situation here. He will be able to learn the offense inside and out (and you know he will) in addition to building up his body and also allowing Davis Webb to build up his resume to impress the league via preseason play. If Rosen checks out medically, it could be a homerun pick and one that I support fully. But here we are, months after the debate started. Rosen vs Barkley. And we aren’t any closer to a consensus than we were back then. It is a good problem to have, as I think both would be excellent choices.